Be still my heart…feminine is in! 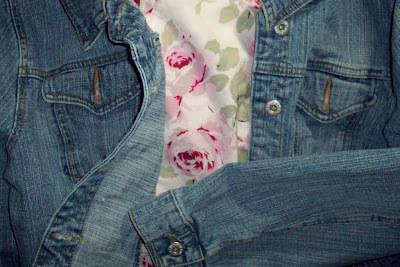 I love sky blue denim. For fun I slid some Shabby Chic fabric underneath for a sneak peek at Springs new fashion trend. 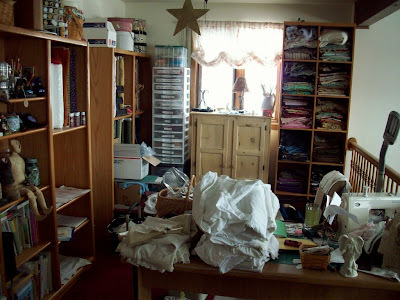 My very untidy sewing studio. Some of you may remember back in October when I wrote about purchasing an old vintage dress form in Ohio during my travels there. While in the checkout line at the antique store, a man came up to me who was very excited it seemed to see me struggling to hold this magnificent find. He asked me what I was going to name her. Name ‘her’? A dress form? It seemed to me that I did remember reading somewhere that it is ‘essential’ to name one’s dress form. Okay, I won’t argue with that. I guess it somehow feminizes the form, sort of like mens’ inclinations to name their boats or cars. I began to ponder a vintage sounding name for about a minute and instantly, ”Lydia” popped in my head. It was as if the ghost of this dressform somehow magically infused my brain with the name-almost like ‘she’ chose the name herself. I went one step further and gave her a surname. Coatsworth seemed English enough and quite appropriate for a dressform. So, Lydia Coatsworth it is, and she seems to be completly delighted with her new moniker. As a matter of fact, I believe she looks like a Lydia, don’t you? About 2 or 3 years ago I purchased a big lot of vintage laces, knickers and various small pieces antique clothing from a woman named Faith. She sold it to me for a song, and I barely looked through the box when it first arrived. Instead, I retired it to a shelf in my studio where it has remained untouched until yesterday. It was then I decided it was time to clean up and reorganize my studio to make my space usable again. I am designing dolls for the magazine with a Feb 1st deadline, so this is my attempt at preparing for inspiration. I can’t possibly get creative if I can’t manage a square foot of space in which to work on. I’m getting my behind in gear. I’ve been enduring a lot of stress and heartburn from just looking at this nightmarish place. As I proceeded to clean, I began sorting through the boxes on my shelves. When I got to Faith’s box, a jolt of excitement hit me as I realized I had forgotten all about the treasures that lie within. I opened it again for the first time, amazed at what I had overlooked. 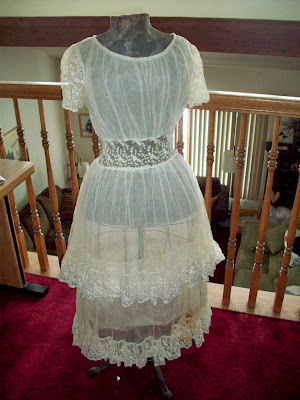 Right on top lay a breathtakingly beautiful lace frock that looked like it could have been worn by a woman sailing the Titanic. As I held it up, it unfurled. It’s discolored laces fell into a pool in my lap. I noticed it was a tiny size and it occured to me it was something Lydia could wear-and with great style, no less! I gently dressed her form, turning her as I smoothed the laces out all around her. She let out tiny creaks of approval as she waltzed around on her stand. The dress fits beautifully, seemingly made for a woman named Lydia. 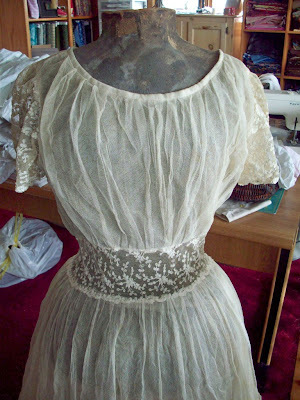 Ms. Coatsworth’s dress is made from antique laces and is gorgeously feminine. I love this style of dress. I am a bit of a girly-girl, loving my femininity, and dressing the part when I can. You can imagine my delight when I received a spring clothing catalog which showed ‘shabby chic’ types of styles, crisp whites and pastels with tiny florals and bits of lace! Curious, I Googled 2008 spring fashion trends, and much to my surprise and delight I found a site that used three words to describe this season’s styles: flirty (yes! ), Feminine (Yes, YES!) and Flowing (YEEEESSS!) Be still my heart, feminine clothing is back in style! I’m looking forward to spring shopping! It looks like light, billowy fabrics are in, topped with sweet, floral prints. I imagine crispy, clean cottons will be available, too, both in bright whites and subtle pastels. I’m already thinking about blush pinks, butter yellows and sagey greens paired with fresh, sky blue jeans (curvey gals all over thank you fashion gods for the 2% stretch Lycra in our jeans!). I can’t wait to slip a daisy in my hair and hit the sunshine. Previous postCan submitting our lists to the universe actually make them come true? I think it is great fun to buy something vintage or “used” and put it up and later on someday rediscover it in a new wonderful and exciting way. 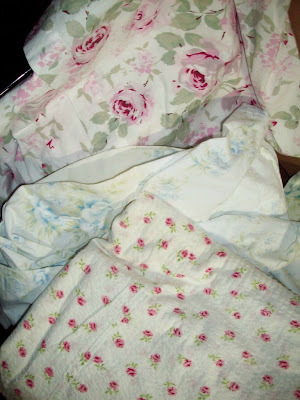 Many of the older textiles I purchase sit on shelves for years only to be rediscovered, fondled and enjoyed! 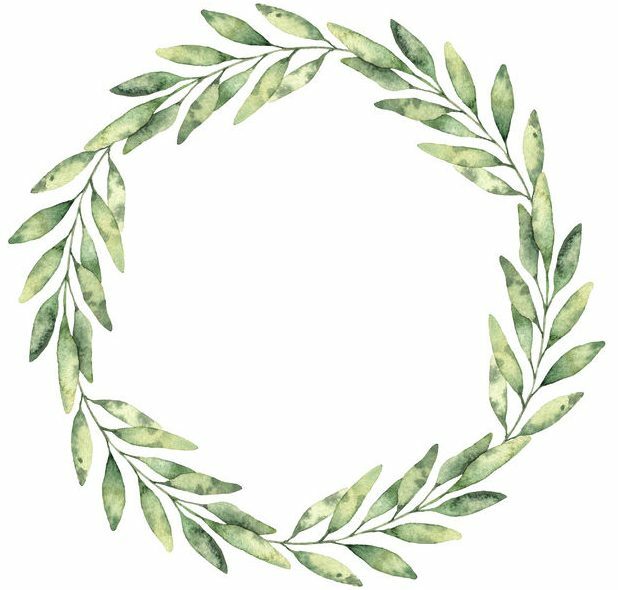 I loved reading this in your post and I enjoy your blog. Thanks so much. Love the dress from it is amazing. I so want to invest in one myself.